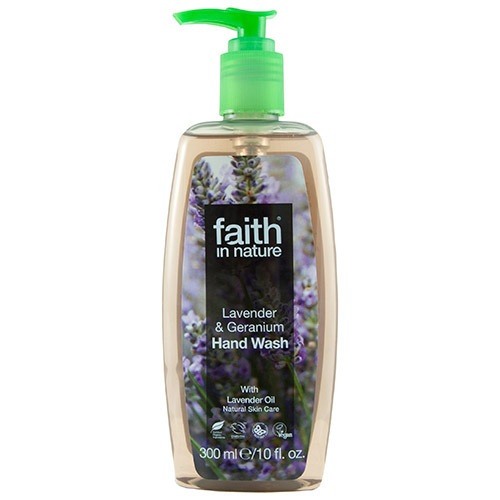 This magnificently fragrant hand wash is a blend of lavender and geranium known for their soothing qualities. Packed with aromas to calm your day. Made with grape skin extract which contains antioxidants. 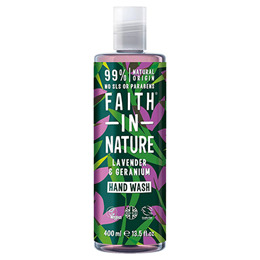 Below are reviews of Faith in Nature Lavender & Geranium Hand Wash - 300ml by bodykind customers. If you have tried this product we'd love to hear what you think so please leave a review. This all natural fragrance hand wash is great. Reminds me of spring. No dry hands either. Great handwash to start with, then gets watery as it reaches half way point. Love it. Only needs a little to wash hands thoroughly. Leaves hands feeling soft and smelling wonderful. Great product. Buying some more. Whilst this soap isn't as rich and creamy as the Coconut hand wash, it is gentle on your hands and has a lovely perfume, making your hands feel and smell clean.